Schematic illustration of the cavity-enhanced TPE concept using a QD-nanocavity system. One incom-ing photon (blue) triggers the emission of two photons (green and red) at lower energy. Within this project we will develop and study advanced GaN-based quantum devices. 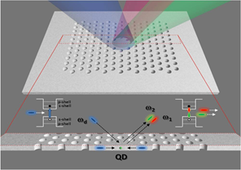 We will demonstrate novel concepts to manipulate the emission process of GaN quantum dots and to exploit non-linear emission processes for the generation of quantum light. This includes single photons with externally adjustable emission energy and entangled photon pairs. For this purpose we will develop nanocavity systems in the GaN material system which allow us to control and enhance the spontaneous emission of single quantum dots by cavity quantum-electrodynamics effects. As a central goal of the project we will exploit the Purcell effect in photonic crystal cavities to enhance the probability of two-photon emission processes which is negligible for bare quantum dots but can be boosted in the presence of an optical resonance of a nanocavity structure. Cavity enhanced two-photon processes will also be exploited for frequency up- and down-conversion of light at the single photon level. Moreover, we will for the first time embed single quantum dots into piezo-controlled GaN nanocavities to tune their excitonic emission energies via external strain fields. Our approach will allow us to realize compact quantum systems for the triggered emission of single photons and entangled photon pairs with adjustable energy via two photon emission processes. Here, the GaN material system is of particular interest because of large exciton binding energies and large band offsets which enable operation at elevated temperatures up to 300 K. Most importantly, GaN QDs exhibit intrinsically a parity breaking which greatly enhances two-photon processes. The results of our project will have impact on the emerging quantum information technology which relies crucially on the availability of advanced quantum light sources.